COTTON KAFTAN - Bold design on Charcoal-black ​IMPORTED Made in Indian Cotton Suitable for lounging at home. 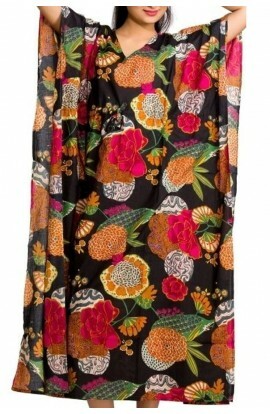 Great for the beach or around the pool Suitable to wear whilst pottering about at home Can be worn as a maxi-dress. Suitable for any bust and hip size up to 52” Length..
COTTON KAFTAN - GREEN & PURPLE PAISLEY ​IMPORTED Made in Indian Cotton Suitable for lounging at home. 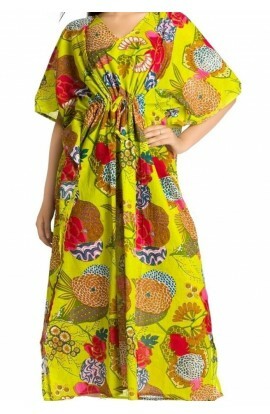 Great for the beach or around the pool Suitable to wear whilst pottering about at home Can be worn as a maxi-dress. 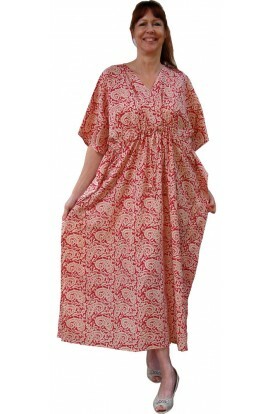 Suitable for any bust and hip size up to 68” Length is..
COTTON KAFTAN - PAISLEY RED & ECRU ​IMPORTED Made in Indian Cotton Suitable for lounging at home. 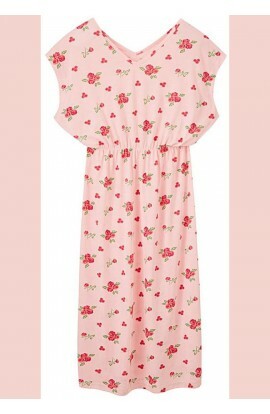 Great for the beach or around the pool Suitable to wear whilst pottering about at home Can be worn as a maxi-dress. Suitable for any bust and hip size up to 52” Length is 51-..
COTTON KAFTAN - PALE-LIME-GREEN DESIGN ​IMPORTED Made in Indian Cotton Suitable for lounging at home. Great for the beach or around the pool Suitable to wear whilst pottering about at home Can be worn as a maxi-dress. Suitable for any bust and hip size up to 68” Length is 51-..
COTTON KAFTAN- BEIGE DESIGN ​IMPORTED Made in Indian Cotton Suitable for lounging at home. Great for the beach or around the pool Suitable to wear whilst pottering about at home Can be worn as a maxi-dress. Suitable for any bust and hip size up to 68” Length is 51-52” ..
COTTON KAFTAN- BLACK WITH DESIGN ​IMPORTED Made in Indian Cotton Suitable for lounging at home. 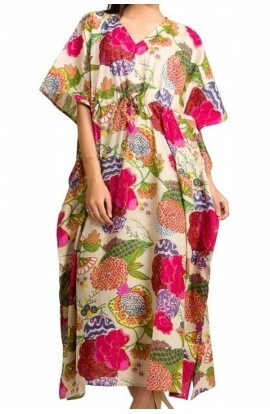 Great for the beach or around the pool Suitable to wear whilst pottering about at home Can be worn as a maxi-dress. Suitable for any bust and hip size up to 68” Length is 51-52” ..
COTTON KAFTAN- CREAM DESIGN ​IMPORTED Made in Indian Cotton Suitable for lounging at home. 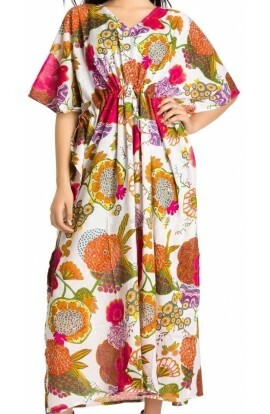 Great for the beach or around the pool Suitable to wear whilst pottering about at home Can be worn as a maxi-dress. Suitable for any bust and hip size up to 68” Length is 51-52” It i..
COTTON KAFTAN- GREEN DESIGN ​IMPORTED Made in Indian Cotton Suitable for lounging at home. Great for the beach or around the pool Suitable to wear whilst pottering about at home Can be worn as a maxi-dress. Suitable for any bust and hip size up to 68” Length is 51-52” It i..
COTTON KAFTAN- PRIMROSE YELLOW DESIGN ​IMPORTED Made in Indian Cotton Suitable for lounging at home. 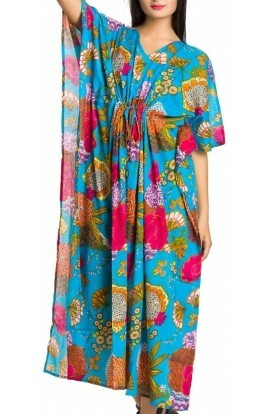 Great for the beach or around the pool Suitable to wear whilst pottering about at home Can be worn as a maxi-dress. Suitable for any bust and hip size up to 68” Length is 51-5..
COTTON KAFTAN- PURPLE DESIGN ​IMPORTED Made in Indian Cotton Suitable for lounging at home. 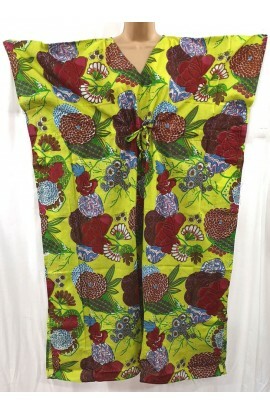 Great for the beach or around the pool Suitable to wear whilst pottering about at home Can be worn as a maxi-dress. Suitable for any bust and hip size up to 68” Length is 51-52” It ..
COTTON KAFTAN- ROYAL BLUE ​IMPORTED Made in Indian Cotton Suitable for lounging at home. 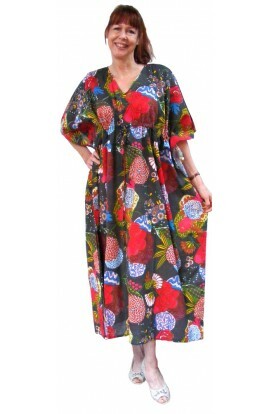 Great for the beach or around the pool Suitable to wear whilst pottering about at home Can be worn as a maxi-dress. 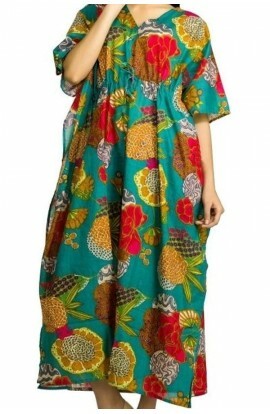 Suitable for any bust and hip size up to 68” Length is 51-52” It is ..
COTTON KAFTAN- TURQUOISE DESIGN ​IMPORTED Made in Indian Cotton Suitable for lounging at home. 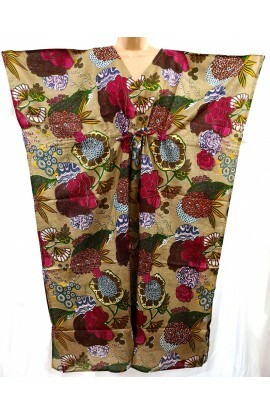 Great for the beach or around the pool Suitable to wear whilst pottering about at home Can be worn as a maxi-dress. Suitable for any bust and hip size up to 68” Length is 51-52” ..
COTTON KAFTAN- WHITE DESIGN ​IMPORTED Made in Indian Cotton Suitable for lounging at home. Great for the beach or around the pool Suitable to wear whilst pottering about at home Can be worn as a maxi-dress. 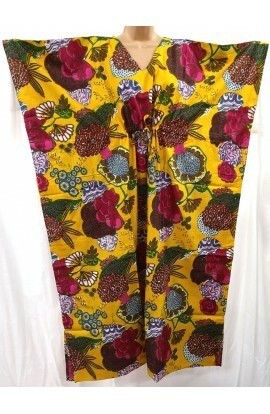 Suitable for any bust and hip size up to 68” Length is 51-52” It i..
COTTON KAFTAN- YELLOW DESIGN​ ​IMPORTED Made in Indian Cotton Suitable for lounging at home. 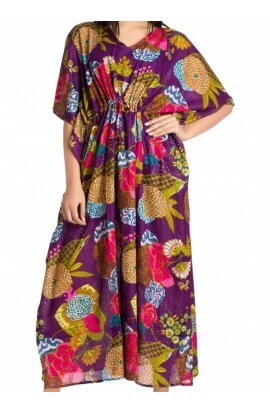 Great for the beach or around the pool Suitable to wear whilst pottering about at home Can be worn as a maxi-dress. 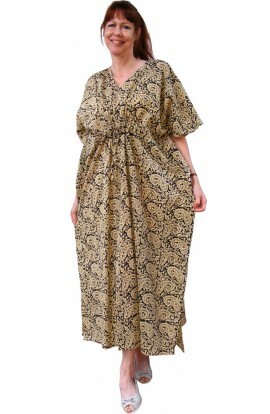 Suitable for any bust and hip size up to 68” Length is 51-52”..
DRESSING GOWN - LIGHT NAVY - plus size This garment has a soft feel surface pile, that has a soft embossed surface. It has a long front zip. It measures 24" across the front at bust level which gives it a circumference of 48" I would say this garment is suitable to comfortably fit a..
DRESSING GOWN - SOFT MAGENTA -plus size This garment has a soft feel surface pile, that has a soft embossed surface. It has a long front zip. It measures 24" across the front at bust level which gives it a circumference of 48" I would say this garment is suitable to comfortably fit ..
FLEECY NIGHTDRESS White with plum-coloured design. A lovely soft fleecy nightie that is so comfortable. Made from 100% soft polyester fleece, the garment measures 28" across the bust level - giving it a 56" circumference. Back length is 46" ..
KAFTAN AND MATCHING SCARF - TURQUOISE BLUE DESIGN The colours are turquoise blue, raspberry and cream. 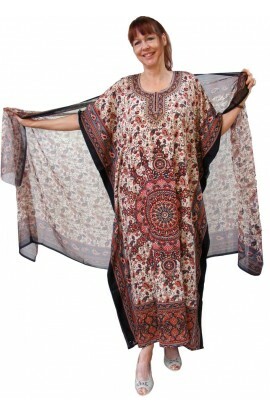 The fabric of the main kaftan is NON-see through polyester. The fabric of the scarf is polyester chiffon. 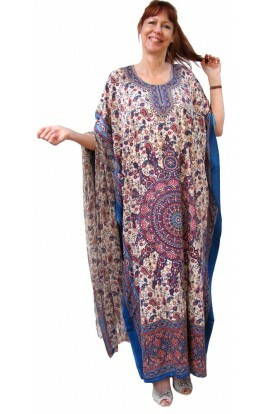 There is a scattered silvery gold toned decoration on the ..
KAFTAN AND MATCHING SCARF - WINE,BLUE GREY DESIGN The colours are wine, blue, grey, cream The fabric of the main kaftan is NON-see through polyester. The fabric of the scarf is polyester chiffon. There is a scattered silvery gold toned decoration on the some parts of the kaftan..